It is always nice to have a chance to watch the future right in front of your eyes. I had this opportunity when invited to Manchester City’s “futuristic” training complex with it’s 22nd century facilities, 22nd century culture and 22nd century playing philosophy. They say that Cathedrals were built to inspire people and raise their hopes and aspirations in life…the Manchester City complex, in and of itself, did the same thing. Built in one of the less affluent areas of Manchester, the training complex would have an elevating impact on anyone who loves the game and looks at the game itself for inspiration. The future, however, is also pretty wary of people seeing too much of it and security was strict – albeit reasonable, friendly and extremely helpful. 1. Parents and family of players. Proof of ID needed to get into the complex. 2. Scouts from other clubs interested in the buying and selling of youth players…which is a massive industry in English and European football. Also several coaches from the English youth national teams. Proof of ID needed to get into the complex. 3. Interested spectators who were admitted due to their affiliation to someone in category 1 and 2. That included me and I was informed by one of the staff, as he was putting a yellow coloured band around my wrist, that I was not allowed to take photos or….take notes!!!! Which is why this report is not that great! This game finished as it began, with Manchester completely dominating possession of the ball and a young Blackburn team trying to keep their defensive shape from being over run. Although they defended valiantly they were playing 21st century soccer but they will not be the last team to be schooled in the art of coordinating player and ball movement to such a sublime level. Against Manchester City teams these days defending consists of chasing a ball around a field and arriving at defensive positions where the ball had been 5 seconds ago…but no disrespect to Blackburn – few developmental teams could have competed with City on this day. Man City had the advantage of having better technical players but, what really struck me was their system of play which put enormous pressure on the young Blackburn team who, to be fair, played some, visibly, younger players who were stretched all over the field. The Manchester team played out of a 4-3-3 as illustrated below. When City had the ball their two wide outside backs push up with the wingers in front of them also pushing up, on a level with the shoulder of the opposing outside back. In a zonal system, this puts the, defending, outside backs into a quandry - the outside backs has to be available to cover for the centre backs – so they are pushed inwards but, they are also responsible for marking the opposing wingers who are positioned right on the touchline – obviously he cannot do both. The consequence of this dilemma is illustrated below with the outside backs getting caught half way between marking the opposing wide player and covering for their centre backs and keeping the back line narrow. The number of times a City player penetrated the gap between the defending center back and outside back was too numerous to count. The 4-3-3 also enabled the Manchester team to attack with 5 players with the City deep lying midfielder, #6, holding in front of the two center backs. This defensive central midfielder dominated the middle of the field, changing and regulating the speed of play by either playing the ball backwards, sideways or forward. His style of play was reinforced by the head coach who sat quietly on the bench much of the time, rising to say to his players, “Keep the ball moving,” “Be patient with the ball” and other gentle exhortations which reinforced the passing driven philosophy which permeates the club from top to bottom. The City GK did kick the ball long several times but playing out from the back with almost religious fervor was far and away the City preference. When the GK has the ball, 5 and 4 split, at the top of the penalty box and 6 comes into the space between them. 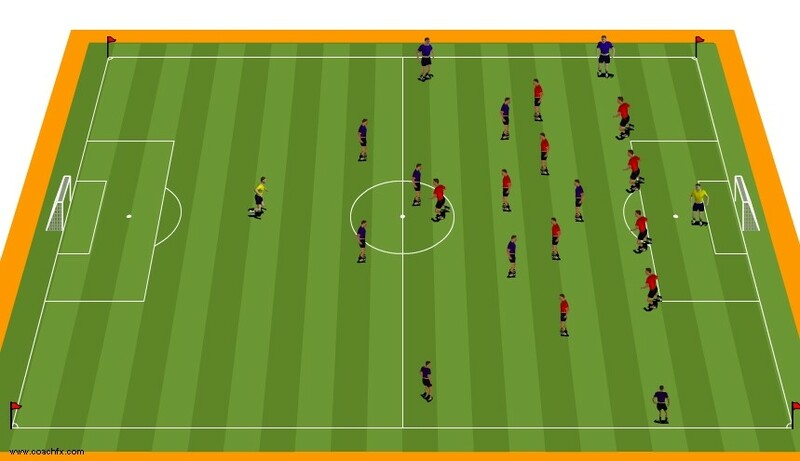 Numbers 2 and 3 push up positioning themselves slightly ahead of number 6 thus providing passing angles for all players within short passing distance. This system, also, enables players to receive the ball sideways on. 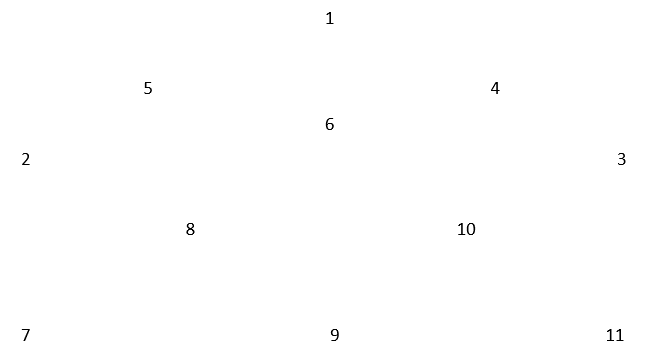 For example, almost every pass from #6 is an angled pass which the team mate can receive sideways on. Passes from 5 to 1, 2 and 6 shall be angled passes and, even a pass to 8 shall be angled if 8 checks back for the ball with an angled run towards 2 or 6. 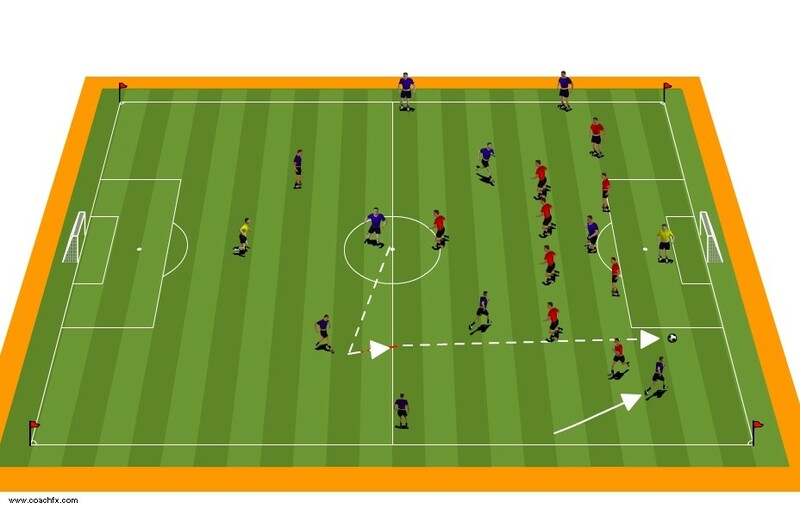 With 5 on the ball another scenario would involve 10 coming across the field towards 5 and 8 rotating out of the space so 10 can receive the ball coming across the field sideways on and the ball passed to his right foot….which would be the foot away from marking defenders. Running across the field would enable the 10 to clip a ball through to the 9, which he did all the time or spin with outside of foot and play ball to 4 ,3 or 11. City’s #9 scored a hat trick…so he was much more than just a rebounder! At 14 years of age he looked like a 17 year old…possibly a reflection of City’s nutrition policy. When options were limited, or City players were pressured from behind, they simply passed the ball to a close by team mate who would, immediately, play the ball back to him. Players would do this several times before moving the ball away from the pressure and exploring some other penetrating options. Another product of City’s style of play was the lack of throw ins which took place in the game. The short passing strategy of City translated to the ball being kept in play for long periods of time. I stood on one of the sidelines and cannot remember more than two throw - ins the whole game. In addition, their first touch capability was high which significantly reduced fouls conceded due to poor control techniques. Defensively, a City three front provided them with the opportunity to put enormous pressure on the Blackburn players and the counter attack became the only viable strategy of the away team. Blackburn always seemed to be outnumbered in and around the area where they had the ball and, as the game crossed the hour mark, they seemed to be resigned to the fact that keeping possession of the ball was virtually impossible and it just became a question of not losing the ball in a critical area unable to keep possession of the ball, the game was played, almost entirely, in Blackburn’s half of the field. With several physically tall players Blackburn’s best chances came on restarts. Outside of the foot passing, long or short, seemed to be a rare commodity from either team. This is just an observation – certainly not a criticism. Inside of the foot passing was far and away the most popular passing technique and, although hooking and driving the ball with the inside of the foot was pervasive I cannot remember players “spinning” or “slicing” the ball very much. Without being able to take notes this is about as detailed as I can get. The final score, 4-0, could have been higher except for some excellent goalkeeping and the referees final whistle came way too quickly……I could not help but mention to a fellow spectator that I could have watched the game all day! He agreed with me as he, jauntily, marched away and it was pointed out to me that his son was the #9! Staff coaches wore the same uniform as their club colleagues, same shirt, track suits etc. Both sets of staff had a staff coach taking notes, video cameras and elevated video platforms. 2. Physical size of players. Although, officially, a U16 game, both teams played several 14 year old players who did not look out of place. They remind me of watching the same age group in Brazil and made note of the size and power of these young players…especially leg development. Quality nutritional programs, together with athletically focused lifestyle is a major contributor to the physical dimensions of these young players. In some European clubs all the age group teams play the same system of play. Age groups with smaller numbers shape the players to replicate the 11v11 shape. Manchester City seem to do that. In addition the 4-3-3 shape enhanced the angles and triangles which helped City play “Sideways On” possession soccer. Modern day GK’s are equally as adept with the ball as their outfield team mates. The Manchester City GK played way outside of his penalty box and was available for back passes, change the point of attack etc. Both sets of GK’s used the “side-winding” technique when kicking out of their hands. City players interchanged a great deal except for their #6 who, basically, ran the game from a deep, defensive midfield position. He stayed as an “anchor” allowing outside backs and attacking midfielders could go forward. This player had special qualities including a wide range of passing techniques, “Head on a Swivel “awareness and ability to shield and protect the ball when under challenge. This player never gave the ball away and played short, staccato like passes to force the opponents to move, thus opening up more passing “windows”. The movement of the City 8 and 10 and the overlapping of 2 and 3 put massive demands on the Blackburn defenders and I am sure they were very tired when the final whistle blew! 6. Free kicks and restarts. With the ball rarely out of play and an, almost, complete lack of fouls the referee seemed to blow the whistle to kick the game off, signify half time, kick off the second half and signify end of game. That is, somewhat simplified account of the referee’s activity and one wonders whether the same is true when City play United at the various age groups. I recall City defending zonally when defending one of Blackburn’s corner kicks. Players who came off to be substituted in the first half went back on in the second half. 8. Passing accuracy and intelligence. City players did not just pass the ball to a team mate – they passed the ball to a team – mate’s specific foot…and there is a big difference between passing the ball to a team mate and passing the ball to a specific foot. Passing the ball to the back foot, of a player who is marked, gives the player an excellent chance of controlling and keeping possession of the ball. The City players have been well tutored in this category. Weight (speed) of pass and spin on the ball (most players like no spin!) are two characteristics of good play and we saw this in abundance on this day. Overall I walked away from the whole Man city experience with a pleasant feeling that football was going in a very positive direction. Not only was the play on the field of the highest quality there was something very different about this atmosphere…the staff made a special effort to make everyone feel valued and welcome. We were not treated as regular “football supporters” but, almost like “clients” with staff that were grateful that we had made the effort to come. It really was a unique morning and afternoon – something very different from what we experienced in the 1960’s and 1970’s. Helping to keep children and other vulnerable people safe when they are with us. We want you to enjoy your day with us. Man City Staff are trained in safety issues. Staff dealing with children and vulnerable people have been subject to a criminal record background check. City has a zero-tolerance approach to bullying and harassment. If any staff member fails to meet expectations regarding abuse City want to know. Abuse is harmful behavior which is either - Physical, Sexual, Emotional, Neglect, Bullying, Financial, Grooming. Be observant – Be attentive – Be careful – Be understanding – Be ready.